McDonald's has apologized for a Big Mac ad that enflamed the fast food giant in a whopper-sized controversy. 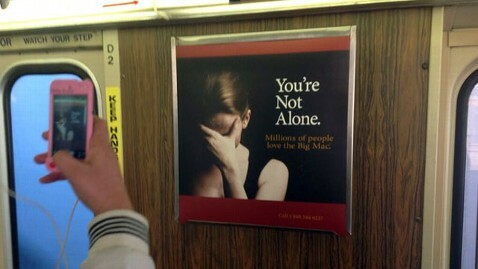 The ad, a poster placed on Boston mass transit, featured a photo of a seemingly despondent woman with her head buried in her hands next to the words, "You're Not Alone," followed by the sentence, "Millions of people love the Big Mac." At the bottom of the ad was a 1-800 number (800-244-6227) that is McDonald's corporate line. The poster quickly went viral after commuters captured it on their smart phones and posted it to Twitter and other sites. David Yamada, a law professor at Boston's Suffolk University Law School, wrote about it on his blog for the university's New Workplace Institute, of which he is also director. "I don't think I'm being oversensitive or too 'PC' about this," he wrote in a blog entry Monday, along with a photo of the poster he took on his own commute. "There are a lot of people who are struggling with their mental and emotional health. They may be highly stressed out, depressed, or even suicidal," he wrote. "The ad writers and executives in McDonald's high-priced marketing operation missed the boat badly on this one. I'm sorry, but the ad is just too close to the real thing to be funny." McDonald's corporate people weren't amused by the ad either. The company released a statement Wednesday alleging the poster had not been approved by the Illinois-based company and asked that it be "taken down immediately." "A local print ad displayed on the Massachusetts Bay Transportation Authority (MBTA) was recently brought to our attention. We can confirm this ad was not approved by McDonald's," regional spokesperson Nicole DiNoia said in a statement issued to the Boston Magazine. "We have an approval process in place, with our marketing and advertising agencies, to ensure that all advertising content is consistent with our brand values. Regrettably, in this incident, that process was not followed. We sincerely apologize for this error," DiNoia said. The responsibility for releasing the ad fell to Arnold MPG, a worldwide advertising firm headquartered in Boston. The firm's president, Pam Hanlin, released a statement in which she said it was her firm, not McDonald's, that was behind the ad. "Arnold apologizes for its mistake to McDonald's and to anyone who was offended by the ad. McDonald's did not approve the ad, and its release was our unintended error. We've addressed the issue and have improved our approval process to ensure this does not happen in the future," the statement read. Requests for comment placed to both McDonald's and Arnold MPG by ABC News were not returned.